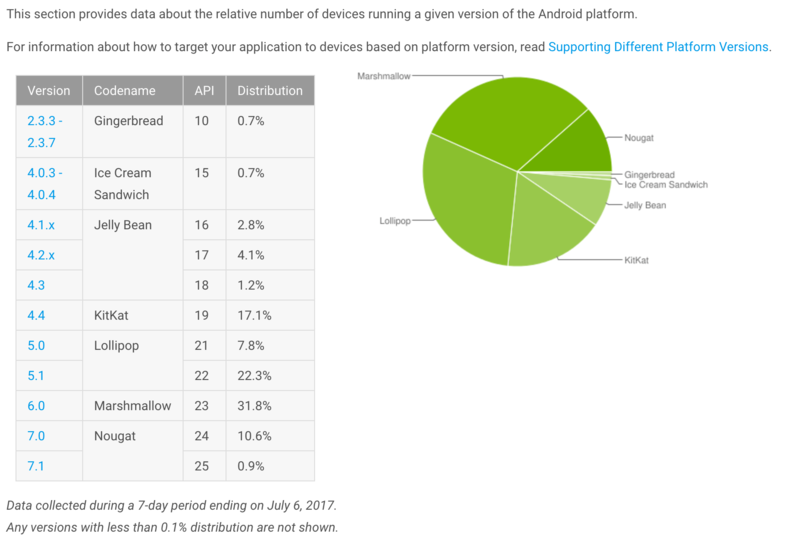 Google has released the July Android Distribution Report for the 7 day period ending July 6, 2017. The report shows that Android Nougat has finally broken through the 10% install base on devices that hit the Play Store during the week, topping out at 11.5%. That is up 2% from the June report. While good news, Nougat still lags far behind the top installed version, Marshmallow. The report shows that Android 6.x was on 31.8% of devices hitting the store, up .6% over the June report. All other previous versions of Android in the report saw declines in install base month-over month. In the case of Android Ice Cream Sandwich and Gingerbread, both sit at .7% of install base. Generally, Google stops counting it when it hits .1% or less so we will likely see these in the next few Android Distribution Reports. Analytics, 1.75% of you came to the site running Android O while 35.08% of you are running Android Nougat. The Nougat number dropped 7.7% month-over-month . Android Marshmallow saw the biggest drop at 12.09%, down to 21.93% of you coming to the site. Lollipop also dropped but just by 4.61%. With Android O expected this quarter, the report shows the challenge facing Google in getting manufactures and carriers to update devices. Hopefully Project Treble will improve the odds for O once it is released.